Further more. the factory is well equipped with the total control system and high technology production machines, which will assure the best efficiency and precision. To achieve the satisfaction for every customer’s need, whether it is standard product or custom made are the factory’s goal. Every step of the process will always be monitored and controlled precisely by our experienced and reliable expert, to maximize and to guarantee the best quality we could achieve, such as aspects of color, variation, and character of the marble. Through its’ dedication and primary material selection, the company wants to o turn each piece of raw material into a natural marble stone product that will remain as an investment with the feeling of elegance and style for years. Marble Block is taken from the rock beds in large blocks before being cut into more manageable sizes which are then transported to the factories. Once the blocks arrive at the factories they are sorted into the color that they are expected to be produced. This is only the first step of determining the colour and the quality. Marble is a natural product, one will only be able to classify the color once the final cutting and final sorting process takes place. •	Cross Cut: The block is cut along the bedding plane. The slab is calibrated in order to make the surface smooth, even and straight flat, and also to achieve the desired thickness. After then, one or both sides of the slab will be polished. After done with the polishing process, the slab basically is ready as finished goods, but if we need them in tiles or other sizes and shapes, we then cut the slab into the desired width, length, and shape. We call this process as the Squaring Process. The color and character of each marble tile will always vary one and another. To standardize the classification, we sort out the variation and quality into Premium Grade, Standard Grade and Semi Select Grade. 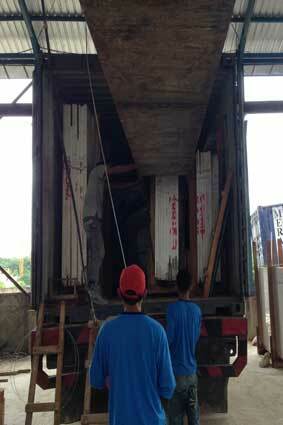 The tiles are packed into high quality wooden crates and are prepared to be shipped to their different destinations. Each crate contains a different quantity depending on the product. The waste water from the production lines, will be collected in a waste tank prepared and periodically the residu / remenance of marble dust at the bottom of the tank will be allocated into a waste hardening process, whereas the water will be recycled to be re-used in the production. of natural stones in all aspect of the industry. Our marble quarries in various locations ensures the continuous supply of raw materials to our factory. Our plants is fully eqquiped with complete and modern machineries, that will fulfill the high quality product requirements.